Mommy Mixology: A Cocktail for Every Calamity! Review + Giveaway! "Sitcom housewives like June Cleaver and Carol Brady made mothering look like a constant joy, but most moms know the reality is far from simple. Getting through the motherhood years will take a good sense of humor and a few cocktails..."
One of my favorite things about going out with my mommy group, besides the adult conversation and time away from the kids, are the drinks! It's one of the few times, I get to relax and enjoy an adult beverage without my child asking "what's that?!" Motherhood is definitely different than I had thought it would be but even more of a blessing than I ever imagined. Needless to say there are times when I feel like I could pull my hair out, and now thanks to this new book I know "there's a drink for that!" Janet Frongillo, a humor writer for Parent: Wise Austin, has authored a new book just for the mommas titled "Mommy Mixology." Janet shares her personal stories of motherhood, mishaps and a good drink to laugh it off. Her book includes easy instructions and colorful photos to make over 60 easy drink recipes (including a few non-alcoholic recipes for the pregnancy months). There are your classics re-named like mimosa (Fertile Myrtle Mimosa), sangria (Sleeptastic Sangria) and cosmopolitan (Cosmopotty) as well as more quirky drink recipes to try and enjoy. Plus an introduction and conclusion on mommyhood and an appendix measurement conversions. Every mishap from permanent marker everywhere to separation is covered and I learned "There's a drink for that!" We're not saying drown all your motherhood frustrations in a drink, but they surely do help sometimes. The book is super easy to read and re-read for when you're looking for that perfect drink. Mommy Mixology is just as refreshing to read as it is to finish the drinks! This is a great book to give to new and expecting moms, those who have just reached one of the "fun" milestones with their child, and would be fun to do with your mom group. 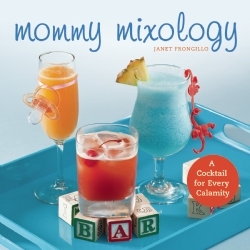 Mommy Mixology by Janet Frongillo retails for $14.99 US and can be purchased at many retailers in-store and online. For more information, see the publishers page here. Disclosure: I was provided a copy of this book without charge by Beth Cook PR company. All opinions contained in this review belong solely to me and were not subject to editing. GIVEAWAY - We have been given TWO (2) copies of Mommy Mixology to give away to our readers. To enter to win, follow the instructions in the form below. Open to US only, 21 and older to enter.